“Greenrock does not support the shift to LNG – this fuel only provides a marginal reduction in Green House Gas [GHG] emissions, while also largely being derived from fracking operations. We are not convinced that this is the way forward for vehicular transport in Bermuda,” a spokesperson said. “With the increasing threat of global climate change, Bermuda has an ethical responsibility to play its part in reducing Bermuda’s carbon footprint. To this end we call on the Government to [i] ratify the Paris Agreement on Climate Change like it did the Kyoto Agreement before it; and [ii] develop a plan for zero-carbon public transport by 2030. 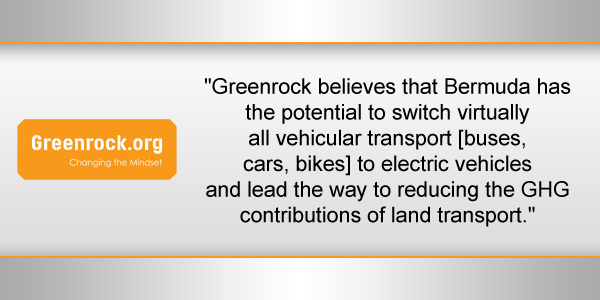 “Greenrock believes that Bermuda has the potential to switch virtually all vehicular transport [buses, cars, bikes] to electric vehicles and lead the way to reducing the GHG contributions of land transport. “We recognise that electric vehicles are only as ‘clean’ as the source of energy that powers them, and as such we reiterate our call for a phased switch away from fossil-fuel energy production to one based primarily on renewable energy sources [solar, wind and marine]. “However, we also recognise that generators producing electricity from fossil fuels are a more efficient conversion of fuel to energy than ICE-age [internal combustion engine] vehicles, leading to greater efficiencies from electric vehicles even where that electricity is ultimately derived from fossil fuel sources. “Furthermore, as the power supply becomes increasingly based on renewable energy sources, electric vehicles in Bermuda will become ‘greener’ over time – while ICE age vehicles tend to become dirtier over time as engines, emissions control equipment, exhaust system and seals deteriorate. “Importantly, while the smoke from the BELCO stacks are perhaps the most obvious sign of air pollution in Bermuda, the more significant source of air pollution [and related public health issues] stem from ICE-age vehicles. “The BELCO stacks have scrubbers which can remove the majority of pollutants before being released, as well as releasing vapour at a point high enough for the remaining pollution to largely not impact public health. “While this could be improved – and is part of our focus on phasing to renewable energy beyond GHG emissions – the emissions from ICE-age vehicles are a far more potent – albeit less visible – public health threat. 7. Develop a timeline for phasing out all ICE-age private vehicles by 2040. “Ultimately, we welcome the focus on greener buses, and encourage people to make active commuting [walking or cycling], public transport or car-pooling their transport choices.